Like oil or coal, natural gas is a fossil fuel. It's colorless, odorless, and emits fewer pollutants than its fellow fuels. 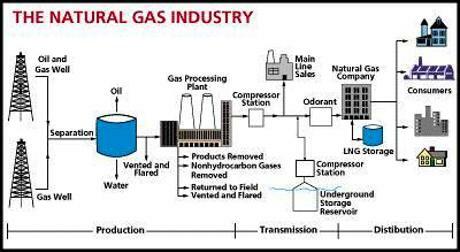 The main component of natural gas is methane, which has an array of uses, from generating electricity to incineration to manufacturing chemicals, plastics, pharmaceuticals, and much more. Step 1: Where's the Gas? Getting access to land that contains natural gas. Step 2: Shake It Up, Baby: Determining how much natural gas might be in the ground. Step 3: Drilling for Dollars: Drilling wells to access the gas. Step 4: Coming Down the Pipe: Moving the gas out of the ground and to a distribution center. Step 1: Where's the gas? Deep below the earth's surface, there are two kinds of rock formations that may contain natural gas. Conventional natural gas comes from wells where gas tends to flow freely from porous rocks and sandstone. Unconventional gas, on the other hand, is packed tightly in rock formations such as shale and coal beds. Step 2: Shake it up, baby! Drilling wells requires a significant investment, so the more gas the company can find, the better. This is the crux of the exploration part of the equation. Seismic exploration involves shaking the ground, recording the energy waves that reflect off the geological formations and return to the earth's surface, and converting those waves into an image of what's below. Proven reserves: The E&P is reasonably certain that it will recover these reserves (probability greater than 90%). Probable reserves: The E&P is more likely than not to recover these reserves (probability greater than 50%). Unproven reserves: Technical, contractual, economic, or regulatory uncertainties preclude the E&P from classifying these reserves as proven. First, the rig is set up. These giant structures tower into the sky, and hold and control all of the drilling equipment. The rig drills a hole, known as a wellbore, deep into the ground. The well casing comes next. This is a tube that's inserted into the wellbore and then filled with cement; tiny explosives are used to make holes in the casing and the surrounding rock formation. Finally, the rig uses extremely high pressure to pump air, sand, water, or gel into the casing, into the holes, and into the rock. This process, called fracturing (or fracking) splits the rock further, allowing gas to flow into the well casing. 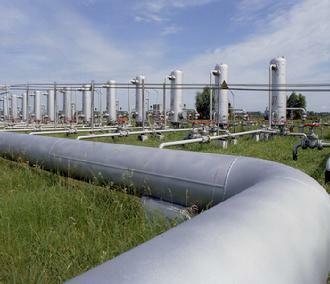 The natural gas is moved via a network of pipelines from the extraction point to the buyer.